GOOD EVENING PARIS! I know it feels like we were literally just here (and we were, for menswear, last week) but we’re already back again – this time for the people-watching extravaganza that is couture. Kicking everything off tonight was Miu Miu with another of its intimate Club shows. And kick things off it did. 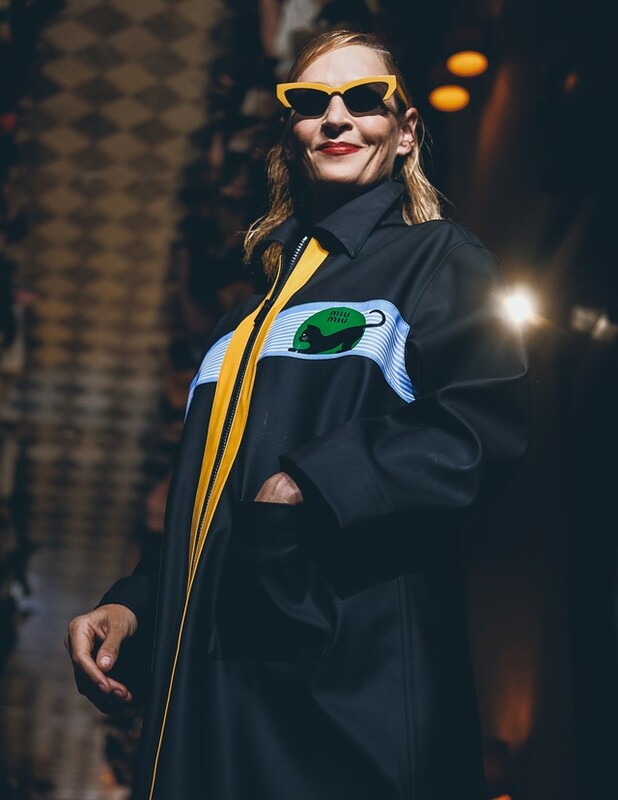 Mrs Prada presented her SS19 resort collection in the foyer of the French capital’s Hotel Regina, where the audience took their seats on soft couches and the plush chairs you might find in an old-school salon. And while the setting might have been really quite something, if you’re currently standing, you may want to take a seat yourself before we rattle off tonight’s casting. First through the hotel’s revolving doors and making her way down the catwalk was actress Rowan Blanchard, before none other than Naomi Campbell, Dazed 100-ers Sadie Sink and Okay Kaya, Jaime King, Chloë Sevigny, Audrey Marnay, Kate Bosworth, Alexa Chung, and Gwendoline Christie followed her through the space. Also on the line-up were Kaia Gerber and Dazed cover stars Fran Summers, Shanelle Nyasiase, and Adwoa Aboah. Think we’re done? Wrong. Closing the show was Uma Thurman (yes, really, Uma Thurman!!! ), who strutted down the runway in yellow sunglasses and a floor-sweeping coat which she eventually unzipped to reveal a full-length green and leopard printed gown underneath. The collection itself was made-up of beloved Miu Miu-isms including cat motifs, maribou trimmed nighties, printed trousers, preppy Varsity-style cardigans and polo shirts, and embellished and bejewelled mini dresses. Looks were accessorised with hotel slipper-esque loafers and suitcases, meaning models were ready to check-in straight off the catwalk. Hotel Miu Miu, we rate you five stars.